Interactive Environment (2017). In collaboration with sound artist Peter Bussigel. The Helms Theatre, Charlottesville, VA. 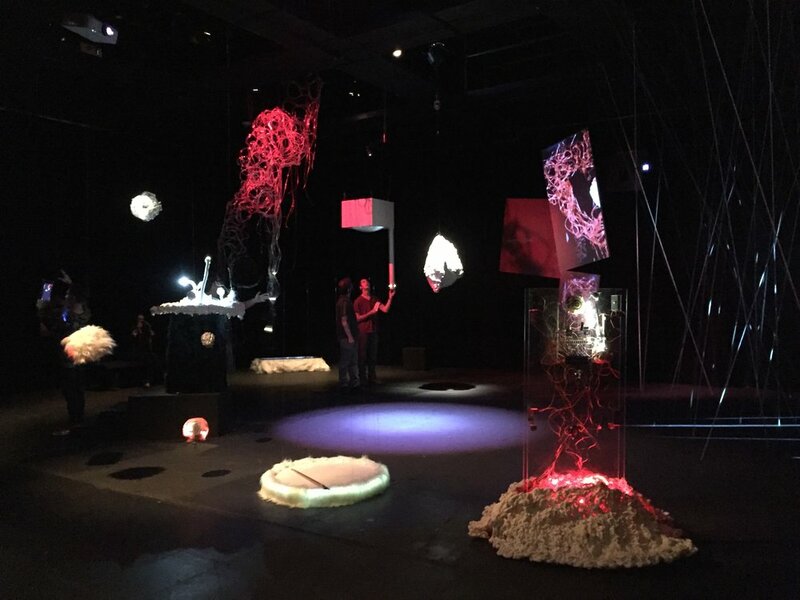 Phase 3 – ii, was the Institute for Interanimation’s first collective environment, combining live streaming media, responsive visual and musical systems, virtual realities, physical interfaces, and audience interaction. This complex system aimed to reimagine the social and expressive affordances/implications of new interface technologies through an interconnected and reactive set of audiovisual modules. Installed in a black box theatre, each module had a distinct sculptural, sonic, and visual identity. Some modules were ‘live’ in that they require the guest/participant to activate or play them, while other interfaces were ‘live’ in that they were autonomous and seemed alive. In essence, the participants and the modules were in constant interanimation, continuously inspiring/in-motion/changing together and each other within the constraints of the system without producing a fixed or predictable outcome. The Institute for Interanimation, an institute dedicated to navigating the unpredictable and forever shifting thresholds between real life and the virtual life, is not only a creative collaboration between the authors but a platform designed to foster opened-ended learning spaces through interdisciplinary project-based research. 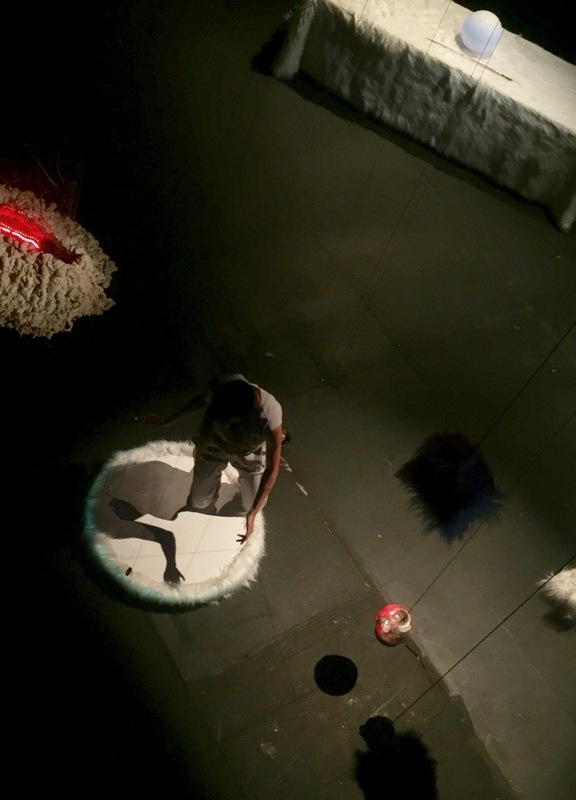 In addition to exposing students to a range of new media frameworks and providing hands-on experience with the affordances and frustrations of working with new technology, a collective comprised of students, faculty members, and local artists came together to co-create the installation. This experimental and pedagogical process encouraged creative collisions and allowed for a deeper exploration of interfacing and identity that reanimated project’s initial objectives. The Institute for Interanimation is pleased to announce phase 3 of our media platform, ii, an interactive environment navigating between here and there, now and then, on and off. We focus on economically sound virtual lives, supplying short-term low-impact hybrid mediums that use the human form to facilitate the production of social knowledge. By designing unique ethical realities into all of our products, ii ensures that your other selves will remain competitive in tomorrow’s world. Join us for calibration procedures at the University of Virginia’s Helms Theatre in the Department of Drama on Thursday September 21st at sunset. Or, visit between noon and 10pm on Friday the 22nd or Saturday the 23rd. Don’t miss this opportunity to escape the boundary condition. ii, another you. Admission is free for certified human guests. The Institute for Interanimation, founded by Mona Kasra (Drama) and Peter Bussigel (Music), has been made possible through the support of a Faculty Research Grant for the Arts from the Office of the Provost and Vice Provost of the Arts.